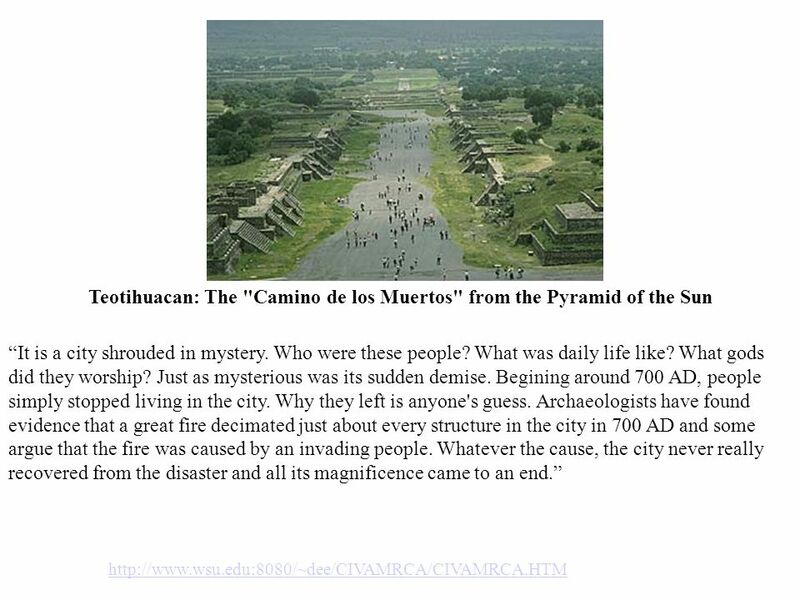 Migrated to Lake Texcoco around 1325 (Mexico) Lake dominated by several tribes and organized into city-states They served as mercenaries because of their military powers. They were disliked and were feared. Their position as mercenaries brought them much wealth and many allies. 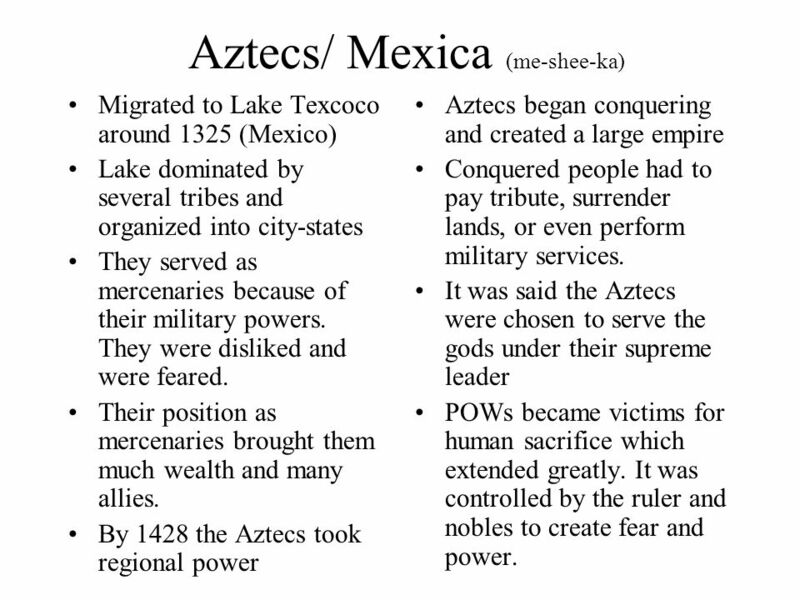 By 1428 the Aztecs took regional power Aztecs began conquering and created a large empire Conquered people had to pay tribute, surrender lands, or even perform military services. 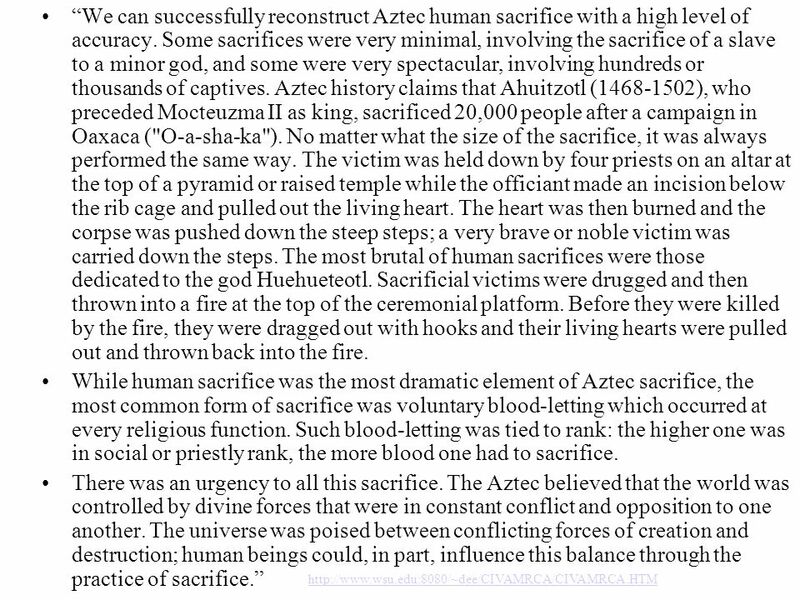 It was said the Aztecs were chosen to serve the gods under their supreme leader POWs became victims for human sacrifice which extended greatly. It was controlled by the ruler and nobles to create fear and power. 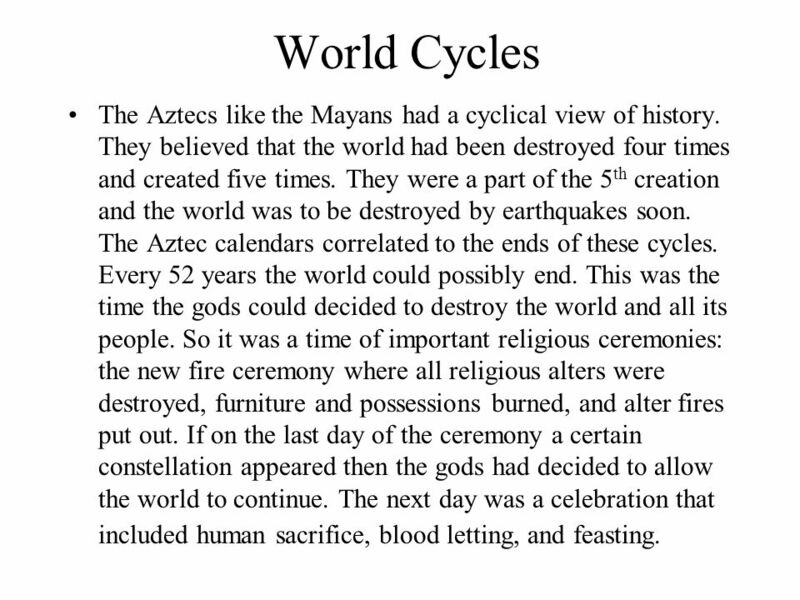 12 World Cycles The Aztecs like the Mayans had a cyclical view of history. They believed that the world had been destroyed four times and created five times. They were a part of the 5th creation and the world was to be destroyed by earthquakes soon. 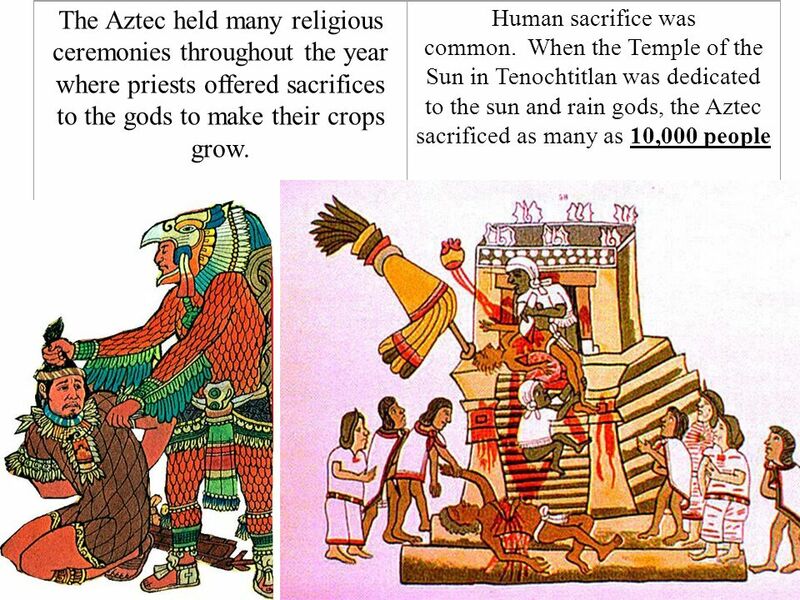 The Aztec calendars correlated to the ends of these cycles. Every 52 years the world could possibly end. This was the time the gods could decided to destroy the world and all its people. So it was a time of important religious ceremonies: the new fire ceremony where all religious alters were destroyed, furniture and possessions burned, and alter fires put out. If on the last day of the ceremony a certain constellation appeared then the gods had decided to allow the world to continue. The next day was a celebration that included human sacrifice, blood letting, and feasting. 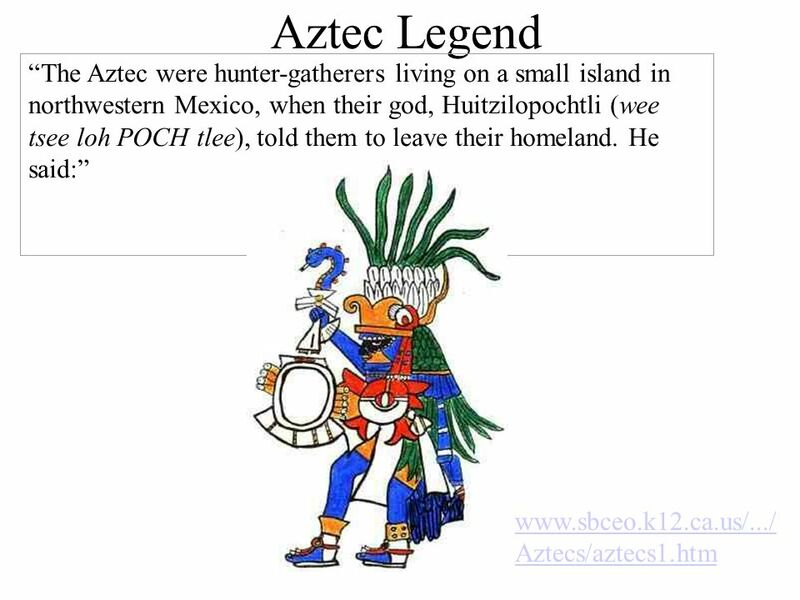 After 200 years of wandering, the Aztec came upon the promised sign. They found the eagle eating the snake on a cactus on a small, swampy island in Lake Texcoco in the Valley of Mexico. There they started to build a powerful empire. 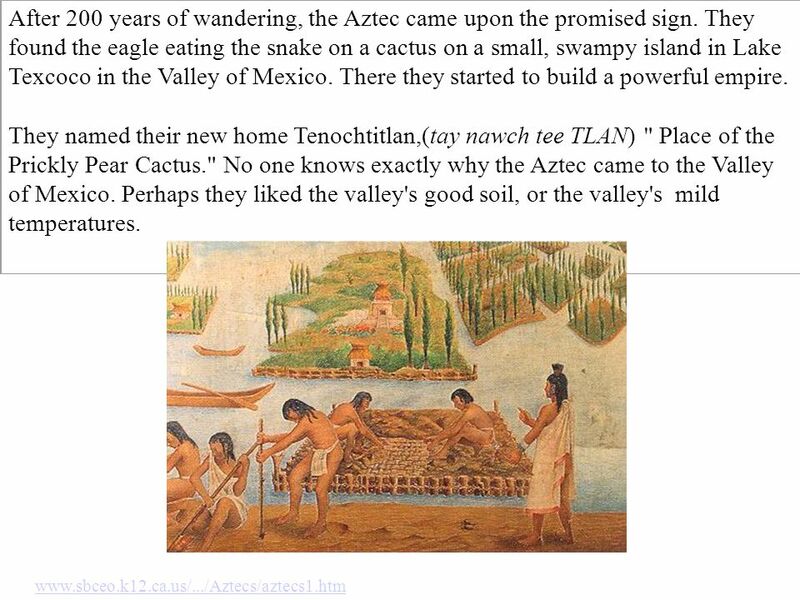 They named their new home Tenochtitlan,(tay nawch tee TLAN) " Place of the Prickly Pear Cactus." 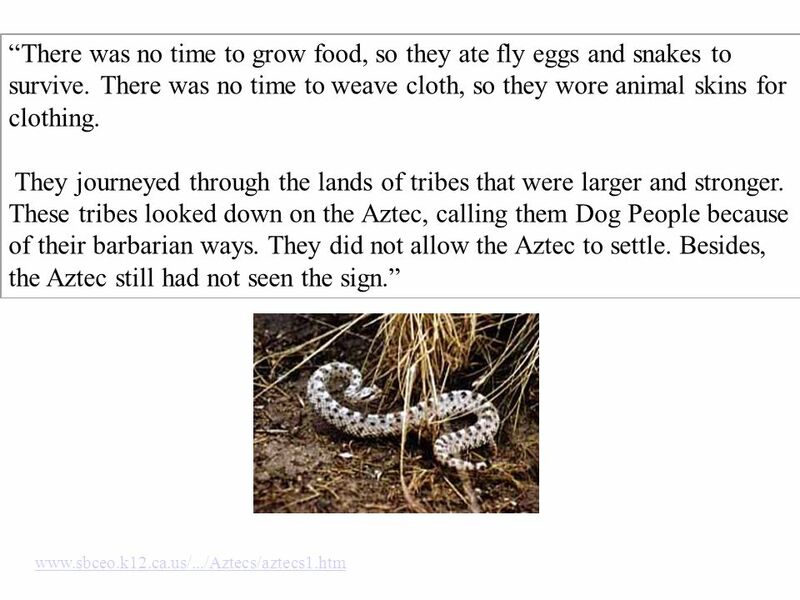 No one knows exactly why the Aztec came to the Valley of Mexico. Perhaps they liked the valley's good soil, or the valley's mild temperatures. 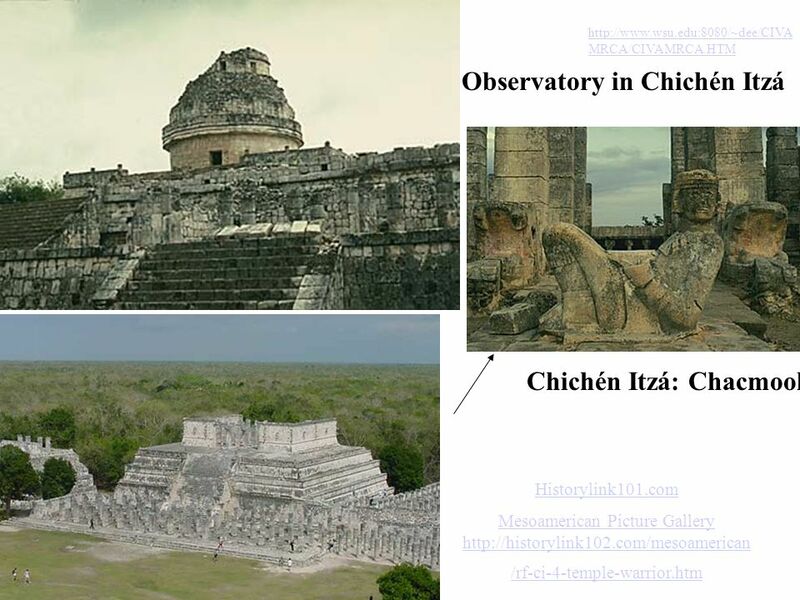 19 The Aztec built fancy palaces, temples, and government storehouses out of stone and brick. 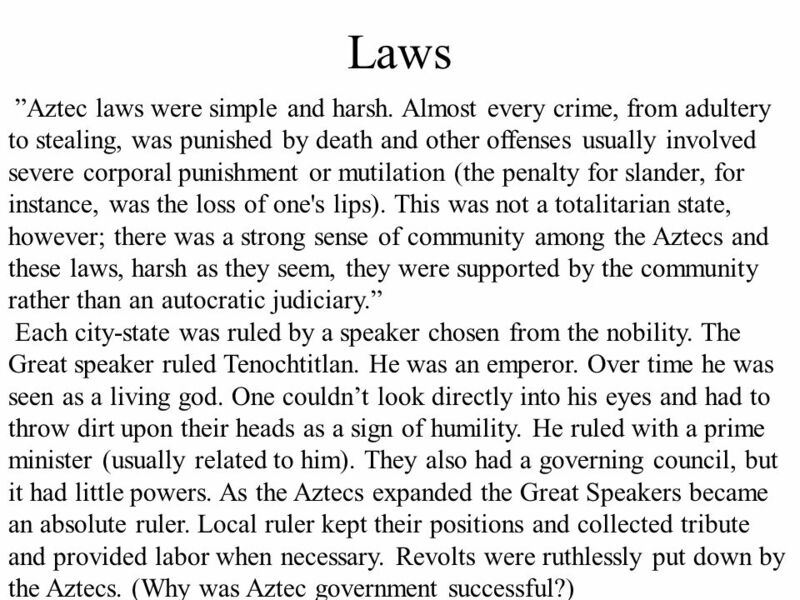 Slaves were the lowest of the Aztec society. Many slaves were captives of war. 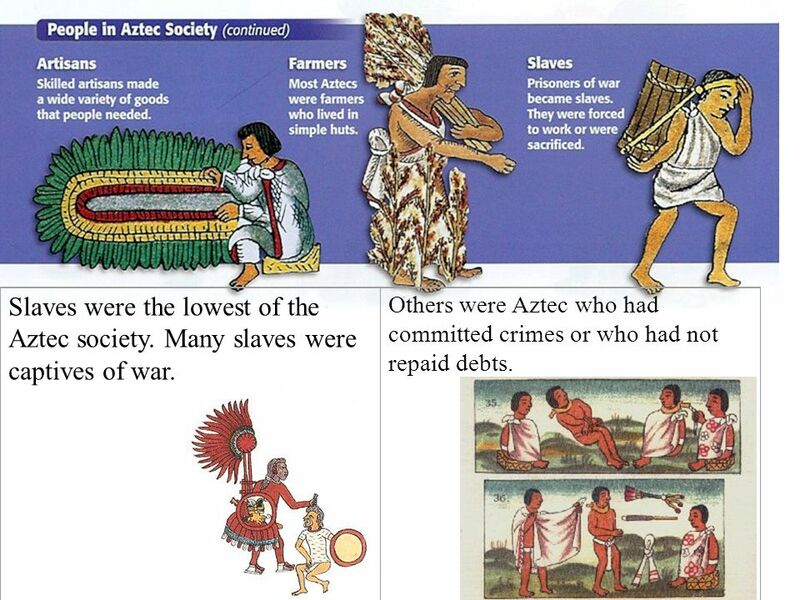 Others were Aztec who had committed crimes or who had not repaid debts. 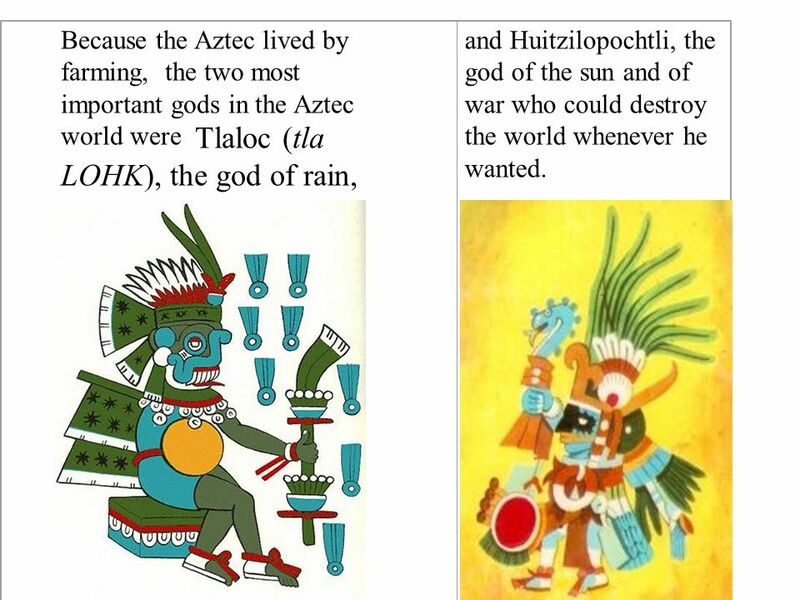 22 Because the Aztec lived by farming, the two most important gods in the Aztec world were Tlaloc (tla LOHK), the god of rain, and Huitzilopochtli, the god of the sun and of war who could destroy the world whenever he wanted. 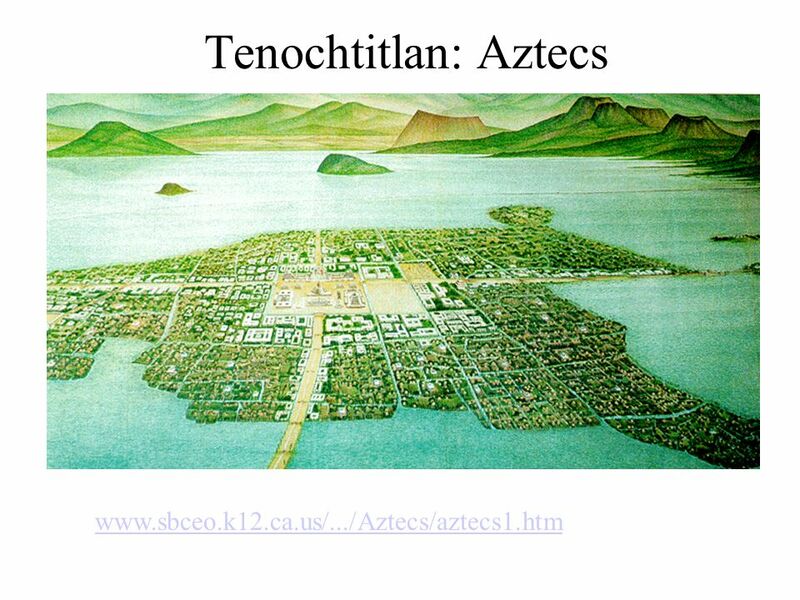 24 Aztec Economy Aztecs formed the city of Tenochtitlan and it was self-sufficient because the Aztecs continued to use a Mesoamerican tradition, chinampas or floating gardens which they build on Lake Texcoco. They were reeds that had mud on top where seeds were planted. Water could reach all the plants and they were very productive. 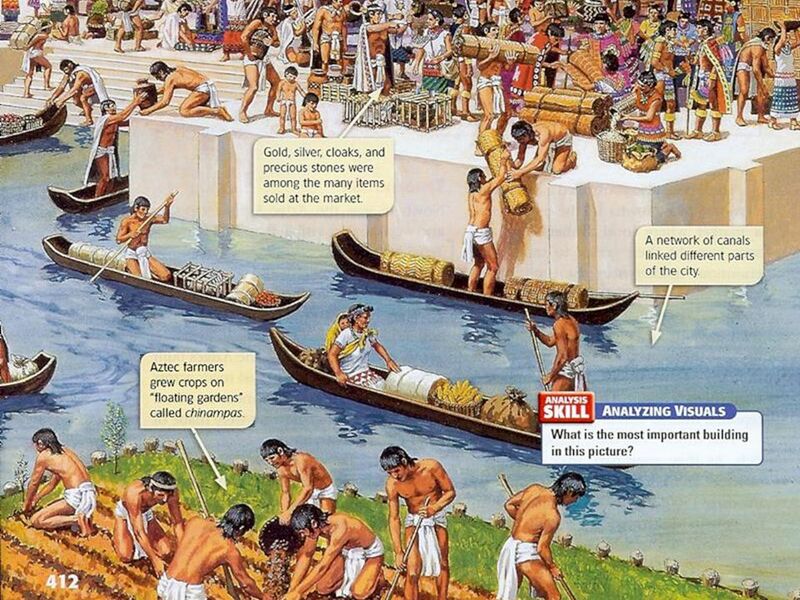 As the empire grew so did the demand for agricultural products. 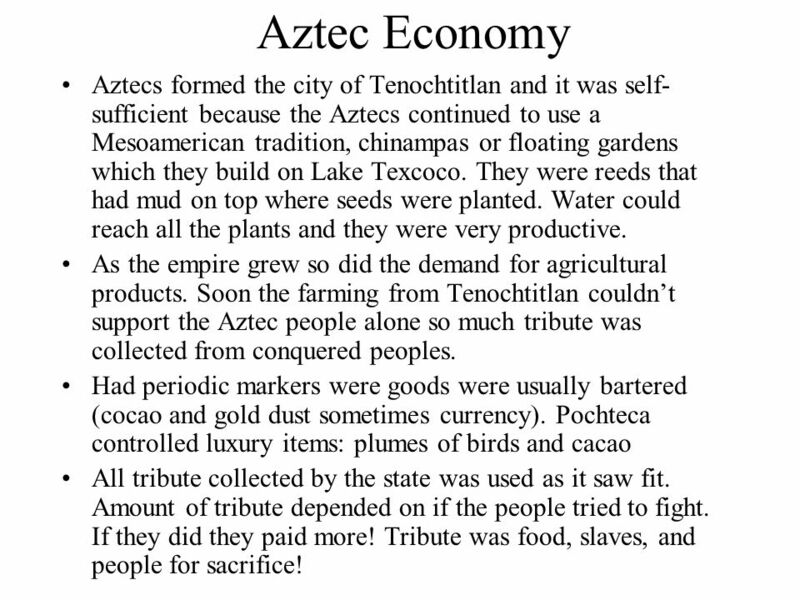 Soon the farming from Tenochtitlan couldn’t support the Aztec people alone so much tribute was collected from conquered peoples. Had periodic markers were goods were usually bartered (cocao and gold dust sometimes currency). Pochteca controlled luxury items: plumes of birds and cacao All tribute collected by the state was used as it saw fit. Amount of tribute depended on if the people tried to fight. If they did they paid more! Tribute was food, slaves, and people for sacrifice! 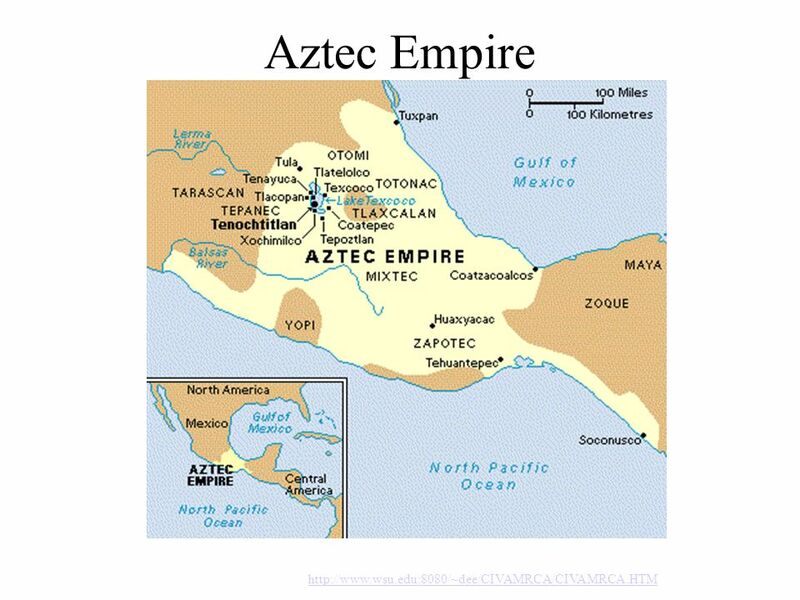 25 Society Aztecs were divided among calpulli or kinship clans. Over time the various calipulli groups had an economic factor where they practiced a specific trade. Over time the calpulli became more divided between commoners and nobles. Specific families making up the nobility. The calpulli were also arranged then by rank. Boys went to school. 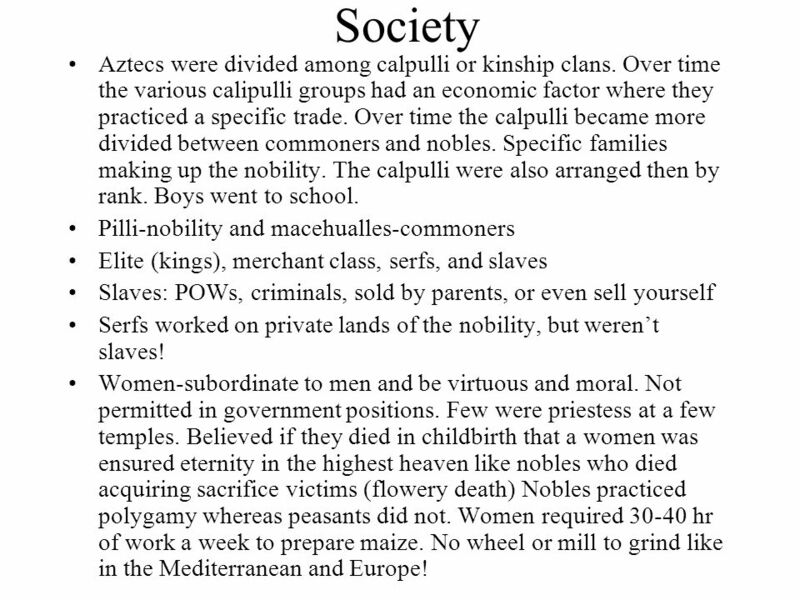 Pilli-nobility and macehualles-commoners Elite (kings), merchant class, serfs, and slaves Slaves: POWs, criminals, sold by parents, or even sell yourself Serfs worked on private lands of the nobility, but weren’t slaves! Women-subordinate to men and be virtuous and moral. Not permitted in government positions. Few were priestess at a few temples. Believed if they died in childbirth that a women was ensured eternity in the highest heaven like nobles who died acquiring sacrifice victims (flowery death) Nobles practiced polygamy whereas peasants did not. Women required hr of work a week to prepare maize. No wheel or mill to grind like in the Mediterranean and Europe! 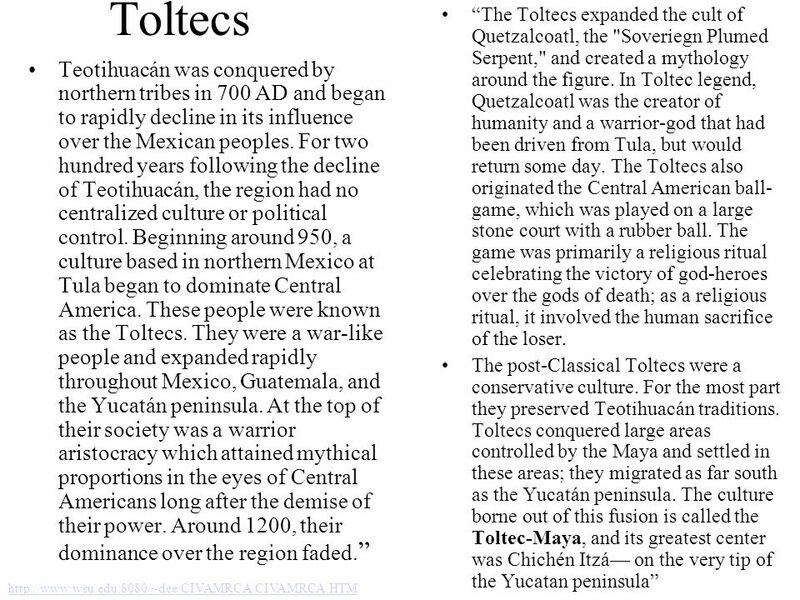 27 Conclusion for Aztecs Increasing social stresses b/c the rise of the nobles, collection of tribute, and system of terror (sacrifices) imposed on subjects caused weaknesses and rebellions. 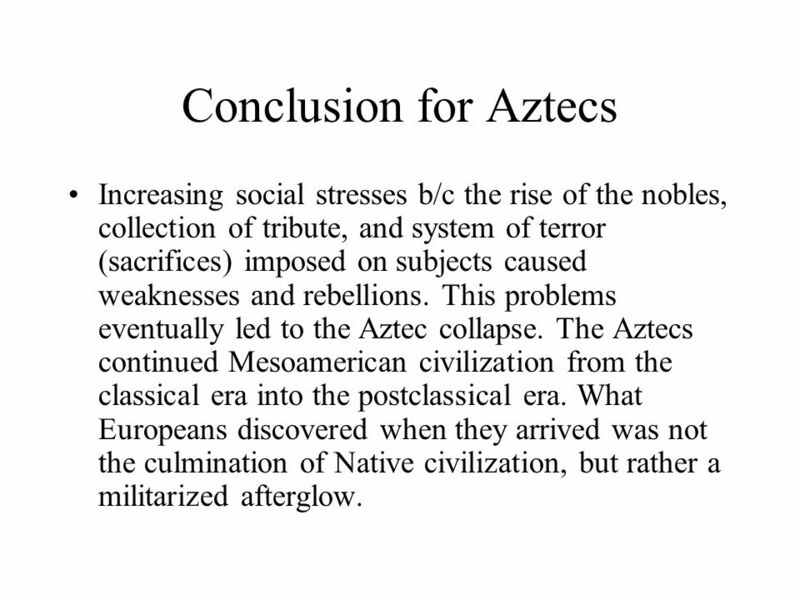 This problems eventually led to the Aztec collapse. 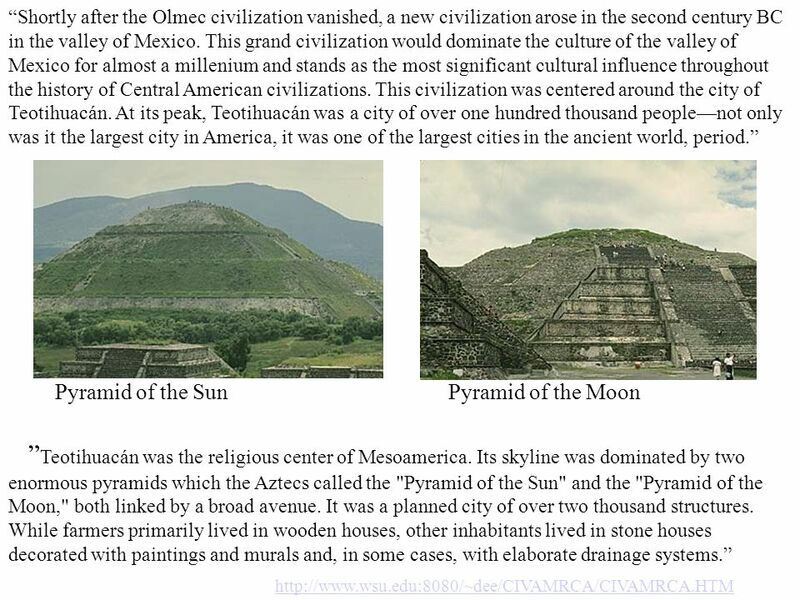 The Aztecs continued Mesoamerican civilization from the classical era into the postclassical era. What Europeans discovered when they arrived was not the culmination of Native civilization, but rather a militarized afterglow. 32 Conquest and Religion Cult of the ancestors: Deceased rulers were mummified and then treated as intermediaries with the gods, they were paraded in public during festivals, offered food and gifts, and consulted by oracles on important matter. After the kingdom of Chimor was conquered by the Incas they adopted the practice of split inheritance. Whereby all political power and titles of the ruler went to the successor. 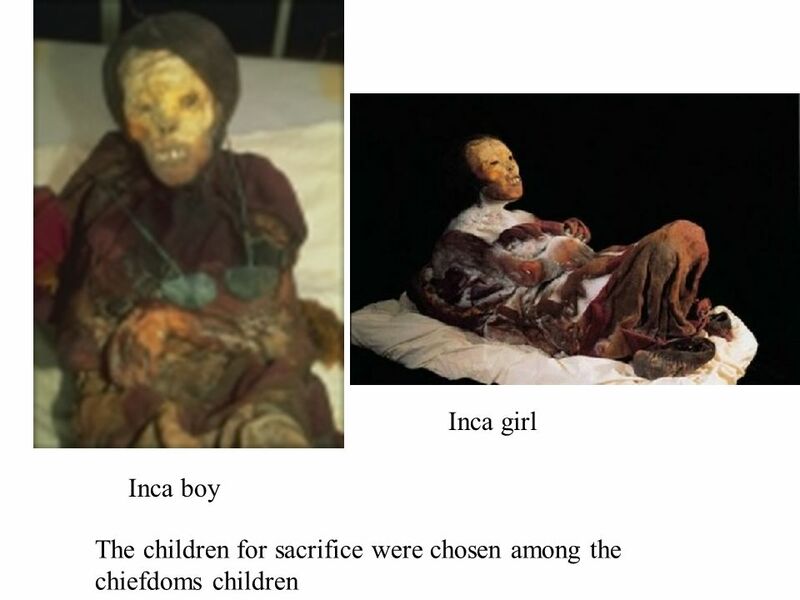 However, all the former rulers palaces, wealth, land, and possession went to his male descendants to use to support the cult of the dead inca’s mummy for eternity. 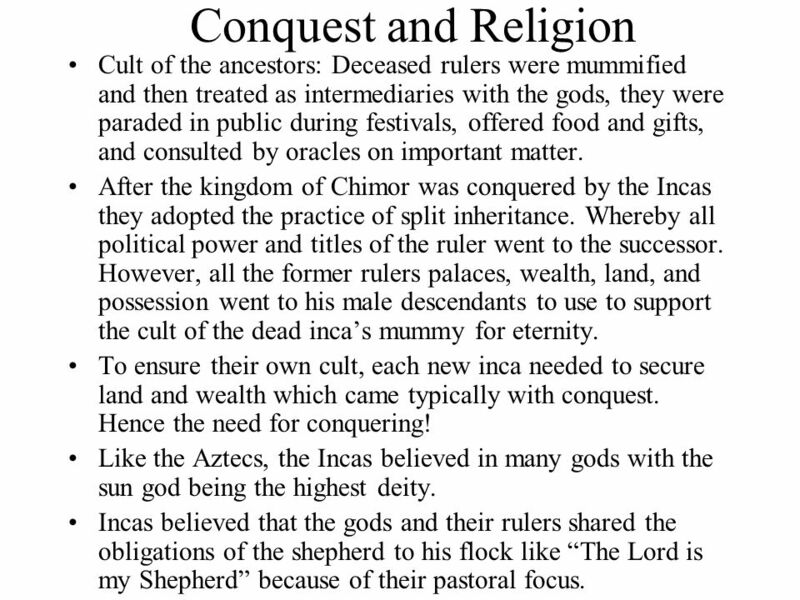 To ensure their own cult, each new inca needed to secure land and wealth which came typically with conquest. Hence the need for conquering! Like the Aztecs, the Incas believed in many gods with the sun god being the highest deity. Incas believed that the gods and their rulers shared the obligations of the shepherd to his flock like “The Lord is my Shepherd” because of their pastoral focus. 33 Human Sacrifice Capacocha: the Inca ceremony of human sacrifice. Little is known of this secret ceremony, however it was a very important ritual that involved sacrificing children. 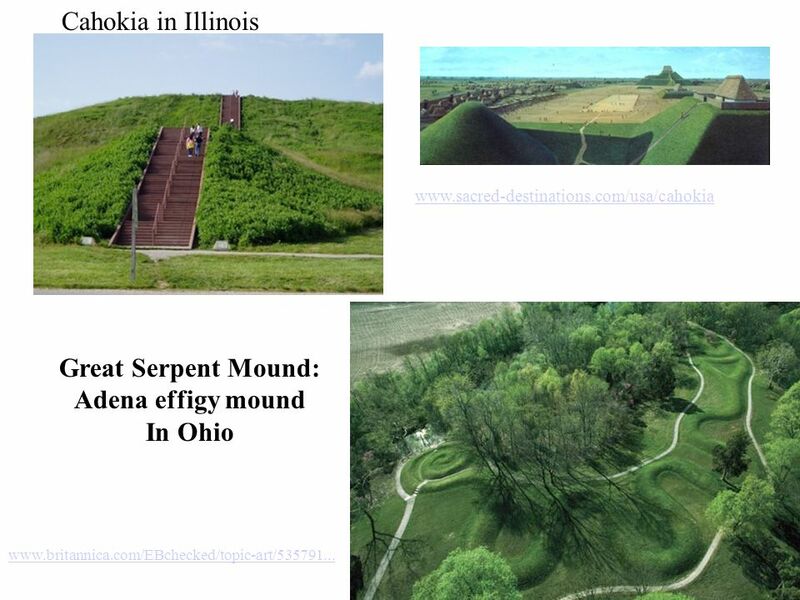 They were elaborately buried in the mountains and then worshipped. 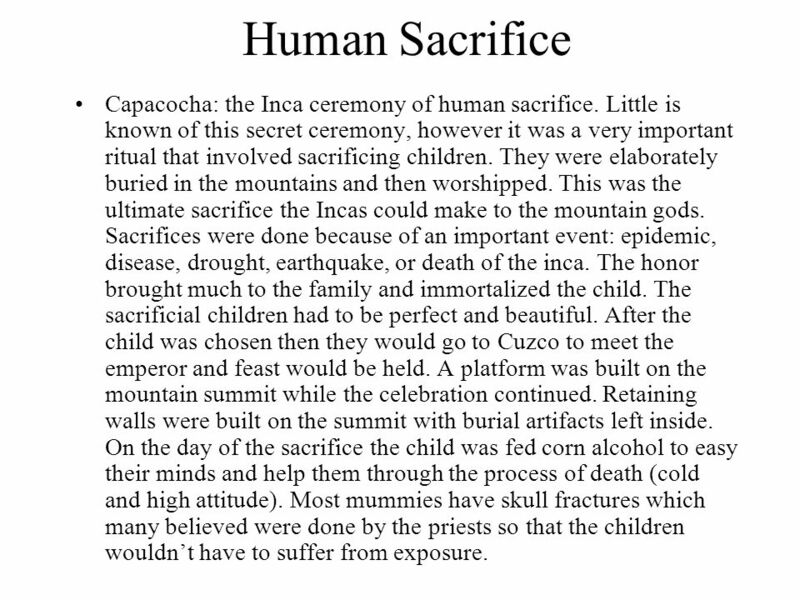 This was the ultimate sacrifice the Incas could make to the mountain gods. 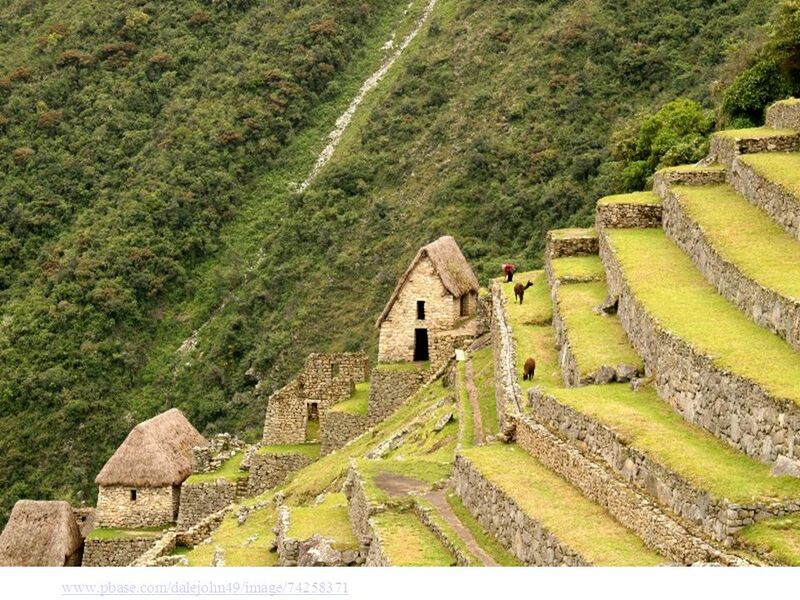 Sacrifices were done because of an important event: epidemic, disease, drought, earthquake, or death of the inca. The honor brought much to the family and immortalized the child. The sacrificial children had to be perfect and beautiful. After the child was chosen then they would go to Cuzco to meet the emperor and feast would be held. A platform was built on the mountain summit while the celebration continued. Retaining walls were built on the summit with burial artifacts left inside. On the day of the sacrifice the child was fed corn alcohol to easy their minds and help them through the process of death (cold and high attitude). Most mummies have skull fractures which many believed were done by the priests so that the children wouldn’t have to suffer from exposure. 35 Rule Created a great bureaucracy to govern the empire. It was divided into 4 provinces with each province under a governor. Then these provinces were divided again. 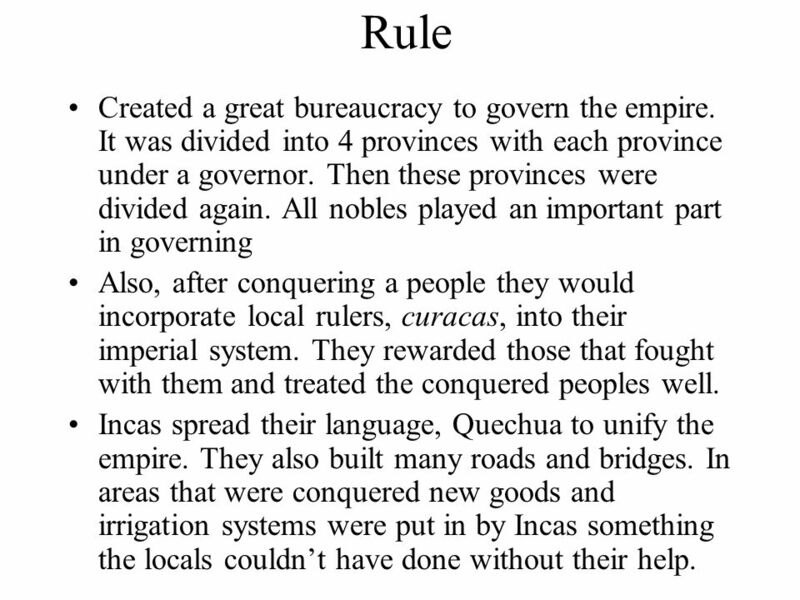 All nobles played an important part in governing Also, after conquering a people they would incorporate local rulers, curacas, into their imperial system. They rewarded those that fought with them and treated the conquered peoples well. 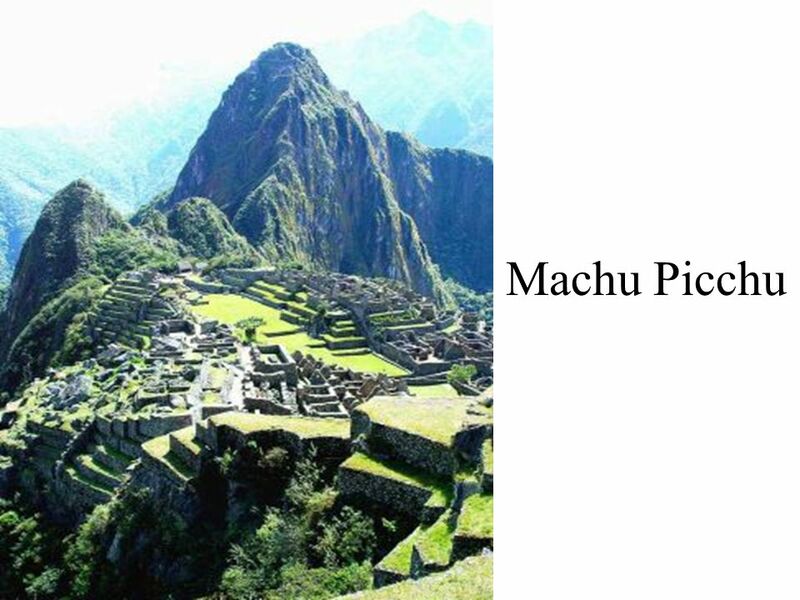 Incas spread their language, Quechua to unify the empire. 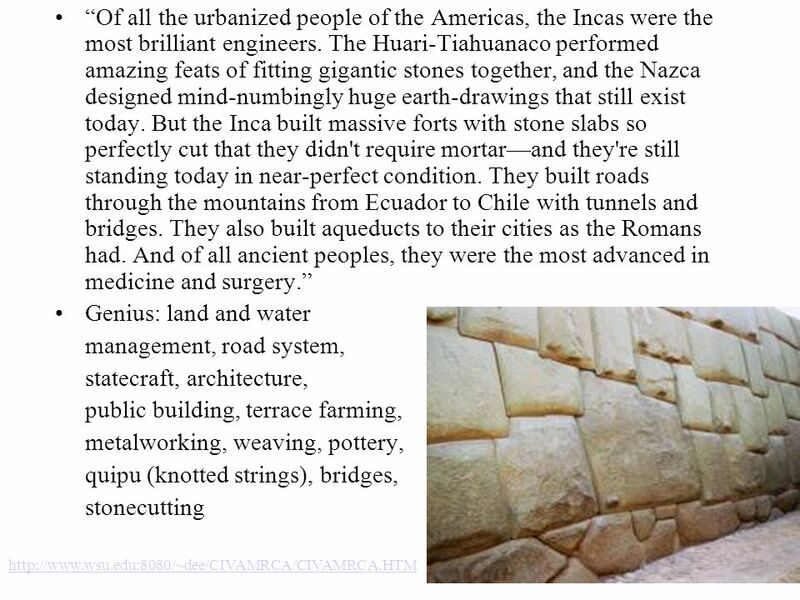 They also built many roads and bridges. 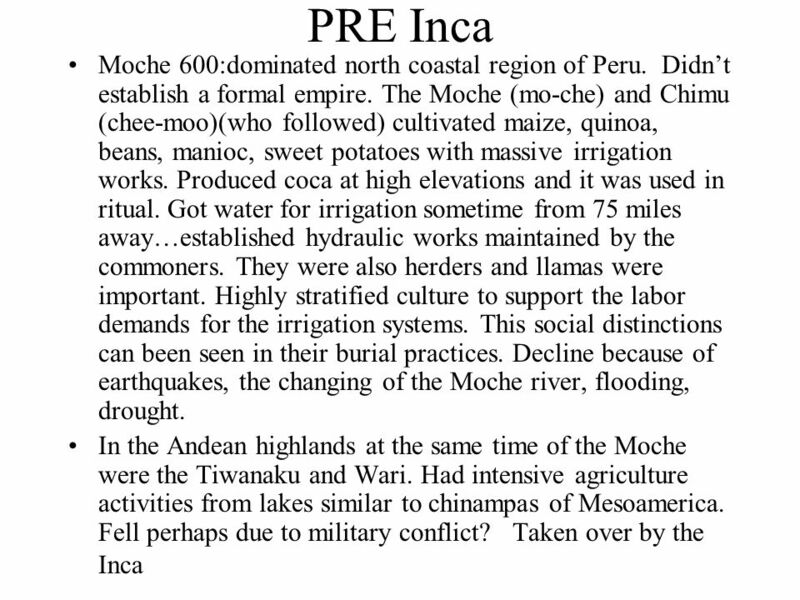 In areas that were conquered new goods and irrigation systems were put in by Incas something the locals couldn’t have done without their help. Took land and labor from subject peoples as tribute They had to work for the state, mita (labor turns). Women had to produce woven cloth for the nobles and religious ceremonies Some women were taken as concubines for the inca. Women could pass property to daughter.The empire had the power to select the most beautiful young women to serve the temples or to be given to the inca. 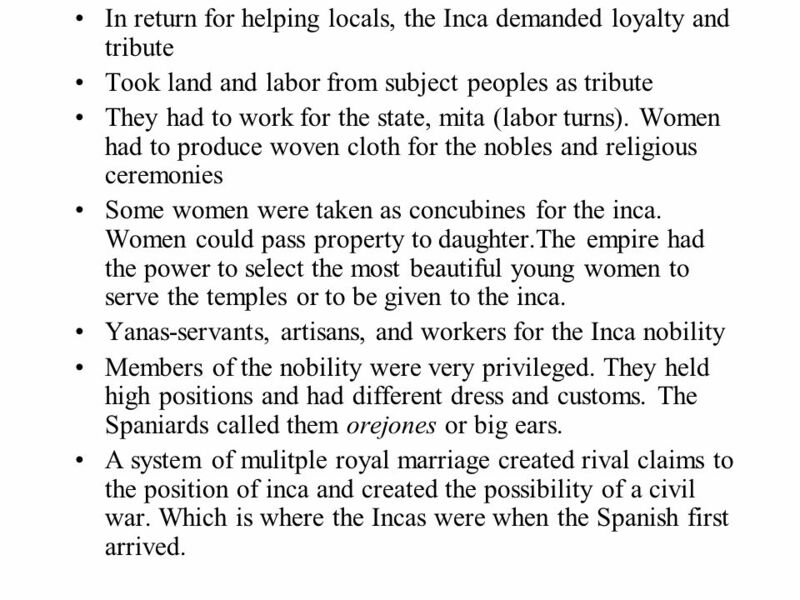 Yanas-servants, artisans, and workers for the Inca nobility Members of the nobility were very privileged. They held high positions and had different dress and customs. The Spaniards called them orejones or big ears. 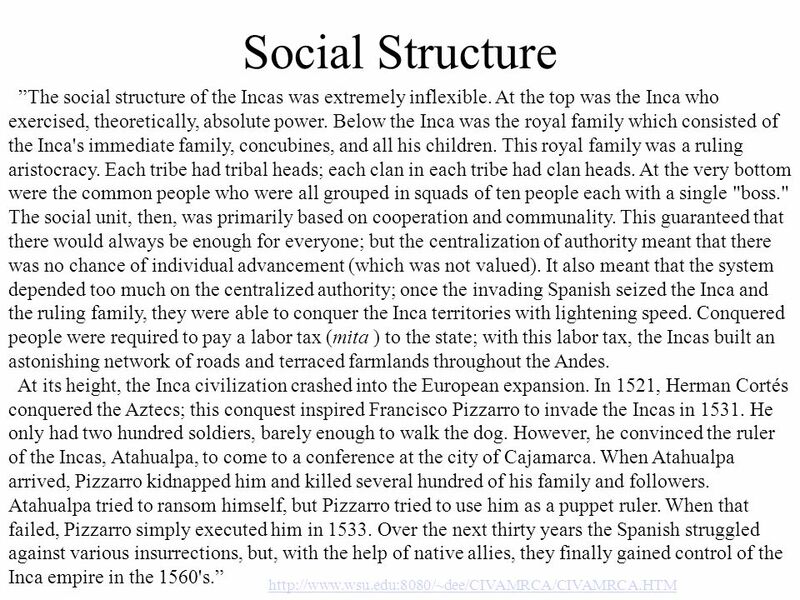 A system of mulitple royal marriage created rival claims to the position of inca and created the possibility of a civil war. 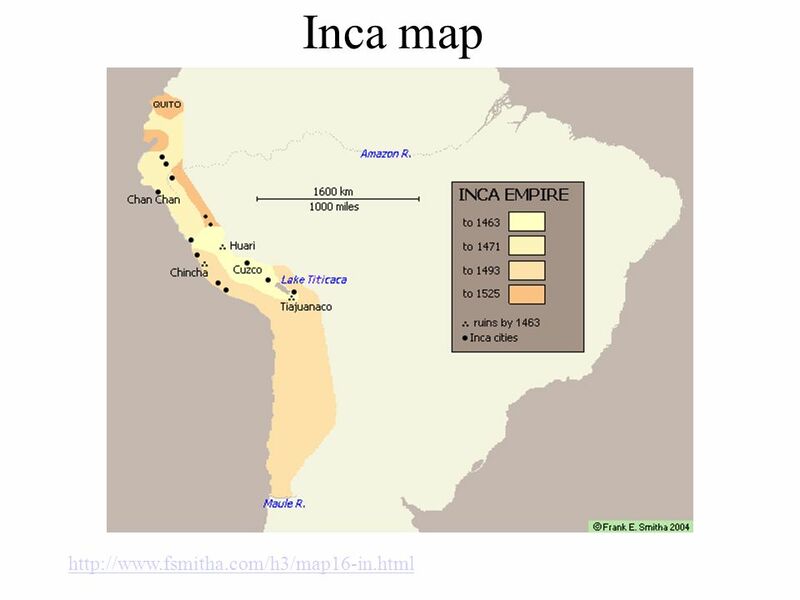 Which is where the Incas were when the Spanish first arrived. 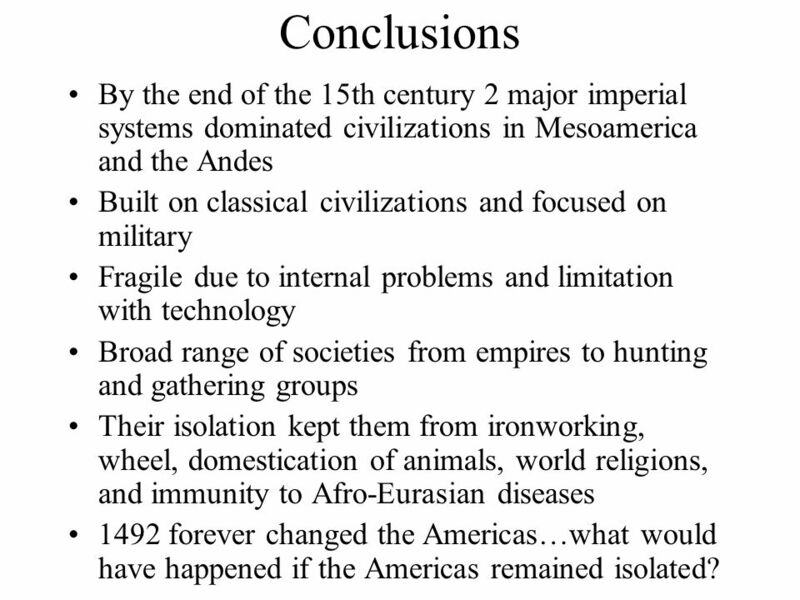 43 Conclusions By the end of the 15th century 2 major imperial systems dominated civilizations in Mesoamerica and the Andes Built on classical civilizations and focused on military Fragile due to internal problems and limitation with technology Broad range of societies from empires to hunting and gathering groups Their isolation kept them from ironworking, wheel, domestication of animals, world religions, and immunity to Afro-Eurasian diseases 1492 forever changed the Americas…what would have happened if the Americas remained isolated? 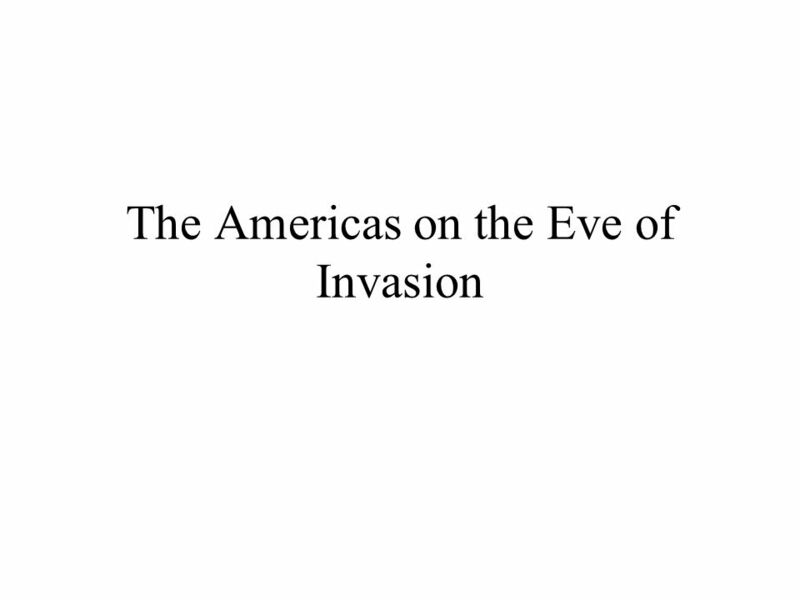 Download ppt "The Americas on the Eve of Invasion"
Warm-up #17 Which Incan achievement was the most impressive to you and why? 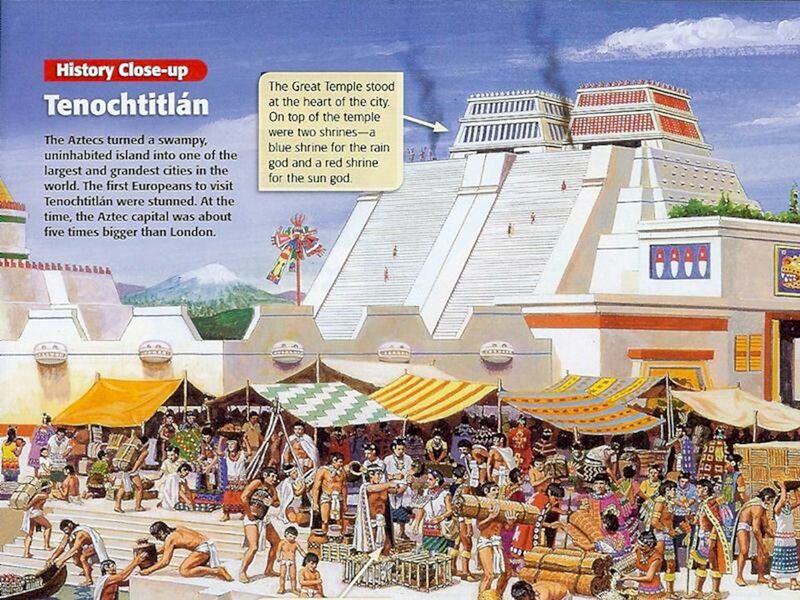 What did you enjoy most about learning about Early Latin American cultures?  The Valley of Mexico, a mountain basin about 7,500 feet above sea level, served as the home base of several powerful cultures.  The valley had several. 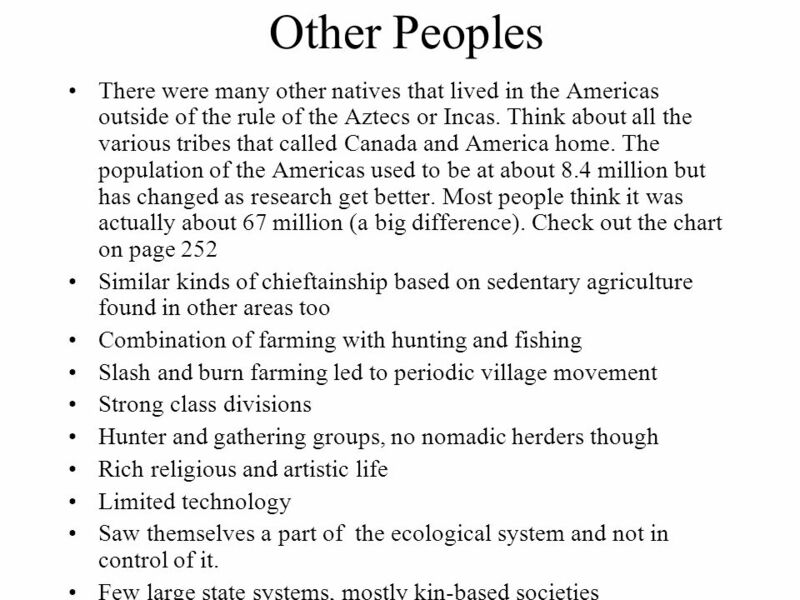 The Americas Ch 11 - The Earth and Its Peoples. 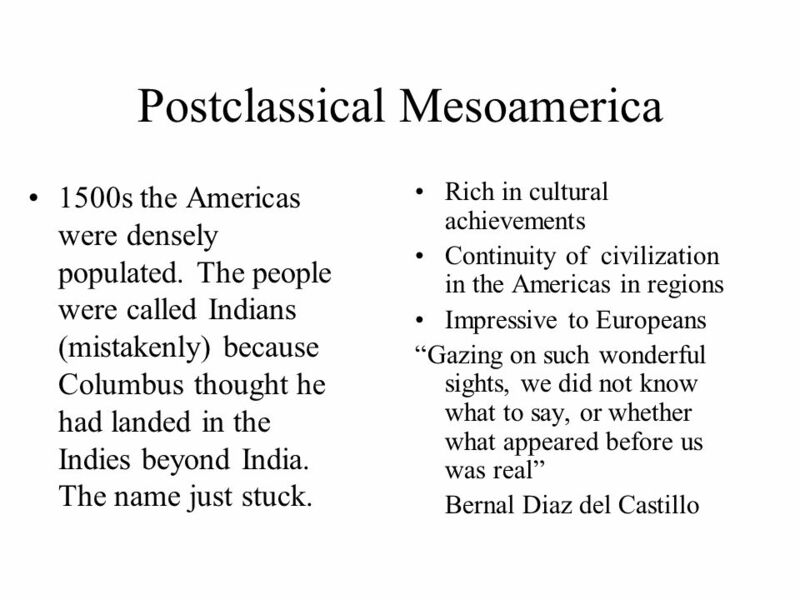 AP World History Developments in the Americas, 600 C.E. to 1400 C.E. 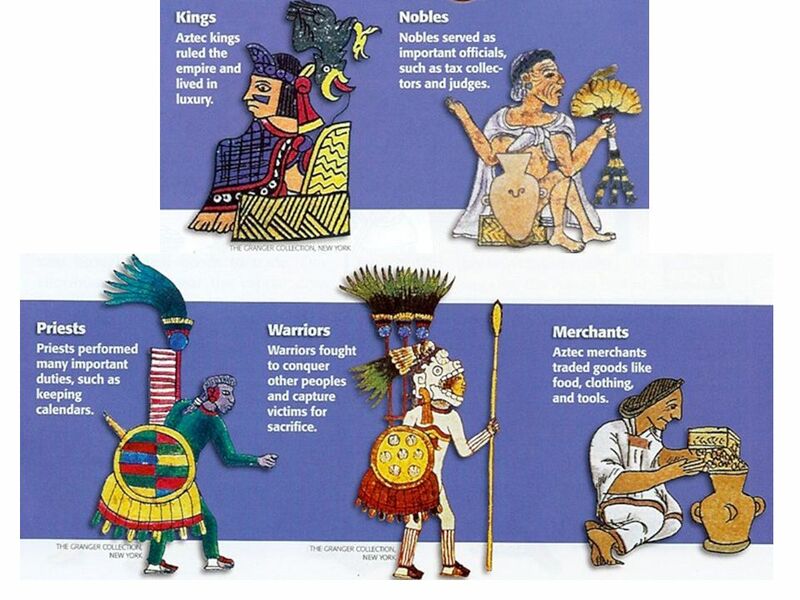 The Americas: The Aztec & the Inca Mr. Osburn AP World History. 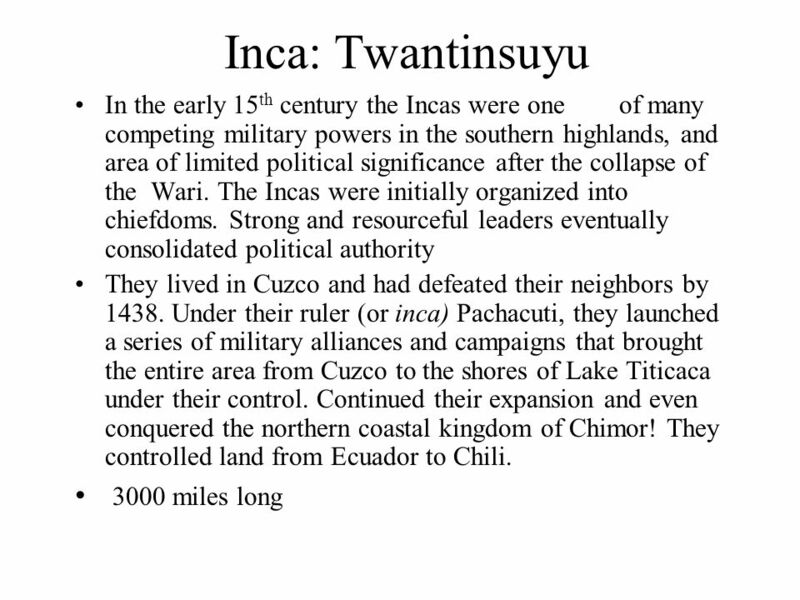 The Inca Create a Mountain Empire. Western coast of South America From present-day Ecuador in north to Chile in South Andes Mountains Largest empire in. 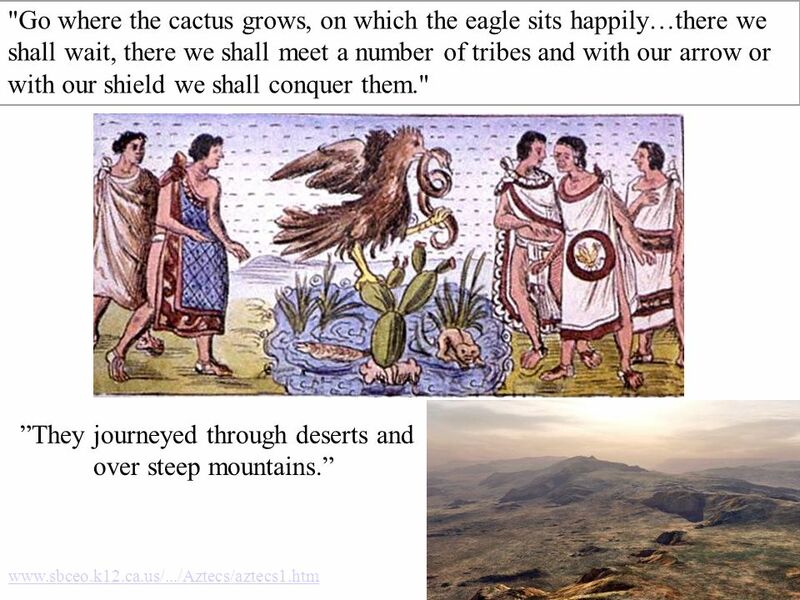 The Aztecs.  What event in the 8 th century signaled a significant political and cultural change? 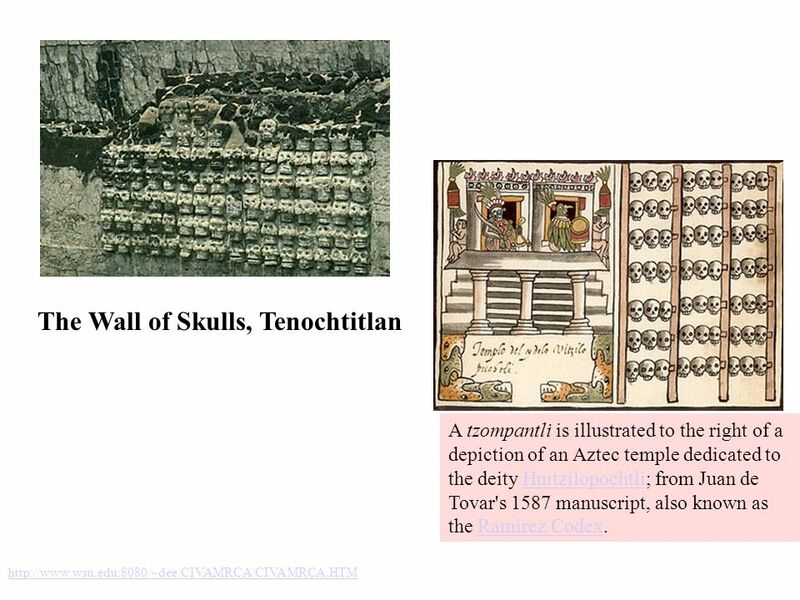  Collapse of Teotihuacan in central Mexico  Abandonment.